So this look was a LOT OF THINGS coming together all at once. 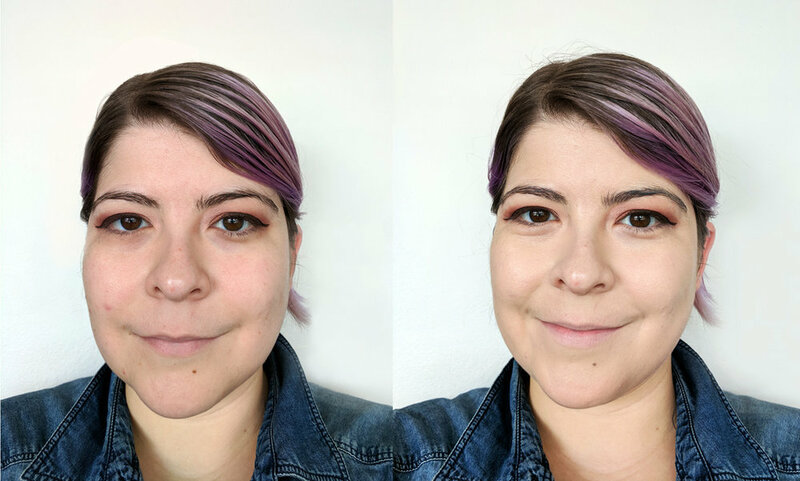 I used a (relatively) new eye & cheek palette from Stila, I had recently redyed my hair at home, and I was looking for a standout "look" to wear while I sat in theaters for an entire day at the Toronto International Film Festival. I know, it sounds like I got dolled up to watch movies in a dark theatre all day and you're PRETTY much right, I did! I'm not going to go over EVERY product I used, but just some of the stand-outs I think really enhanced the look. Eyes - A few months ago I stumbled upon a clearance sale full of Stila products from a company offloading the brand and it CHANGED MY LIFE. One of the products I managed to pick up was this Stila Perfect Me, Perfect Hue palette in Medium/Tan - $51CAD on a lark and it's the perfect bronze/rosy addition to my eyeshadow collection. For this look I used the smooth and buttery Captivating on my inner eye and to highlight under my brows, Curious as my base, Feisty in my crease and Daring, a beautiful bronze with golden shimmer, all over my lid. The only shade I'm not a huge fan of in this set is the 'liner' Magnetic which drags a bit, but literally every other shade is fantastic, very blendable and pigmented. I'm really pleased that this palette ismy first Stila eyeshadow and I will DEFINITELY be grabbing some more in the future. I also love this kit so much I'm taking it with me on my trip to Portugal in a few weeks as it makes a great traveler since the case closes well and is very sturdy! Cheek & Bronzer - Guys, it's happened. I've TOTALLY hit pan in my Tarte Cosmetics Amazonian Clay Waterproof Bronzer in Park Avenue Princess - $38CAD which I swear I've had for YEARS. It's a really light bronzer with a nice golden shimmer, and it layers and blends nicely so you can go for depth or just fake a healthy glow. I tend to do a light contour and all over shimmer with this colour, and I can pretty much use it all year long. I. Love. It. On my cheeks I used Mysterious from the Stila Eye & Cheek palette I mentioned above, which is a rosy neutral blush that worked perfectly to accent the look without drawing too much attention from the eyes and lips. IT Cosmetics Before & After! Base - For this look I wanted a medium weight foundation that offered a more coverage than a BB Cream or Serum, but not a heavy one that I would have to build upon. So I chose IT Cosmetics CC Cream in Fair - $49 CAD, I've been using this CC cream as a mid-weight foundation after receiving it for review and it's absolutely flawless, offers amazing SPF coverage of 50+, and smooths out any texture on my skin or blemishes. In brief, I love it. Because we're having a totally bizarre fall with a LOT of warm weather and sun, I still have a bit of a summer tan so I dab in a darker foundation to deepen in slightly (an old Benefit foundation sample I have that's too deep for me) and voila! It's a GREAT medium-coverage foundation, and as somebody with combination skin, it doesn't leave me too greasy OR too dry. It is long-lasting and while it's not a full coverage foundation, I know I can trust it to not look a mess at the end of the day. And did I mention how amazingly comfortable it is? You can get IT Cosmetics at ITCosmetics.ca or at Sephora here. Hair - Anyone who's been following me for awhile knows that my hair has been a myriad of colours over the last year or so. 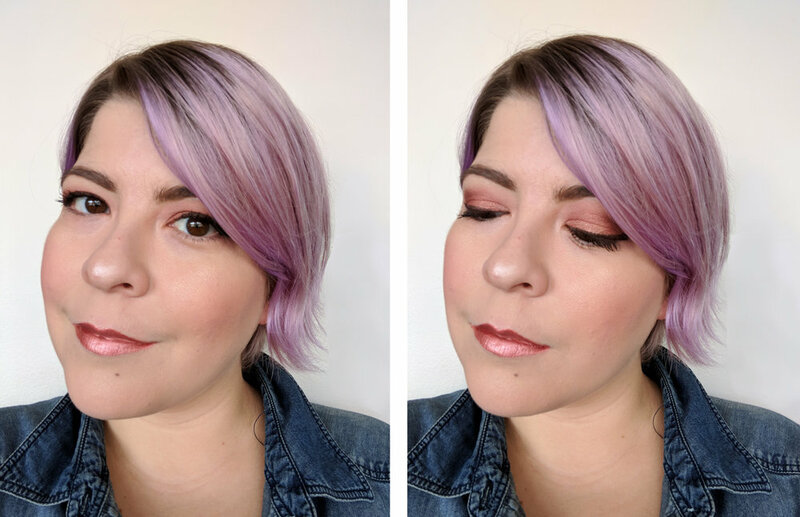 I recently did a GORGEOUS orange/peach in the early summer at Parlour Salon in Toronto (shout-out to Jen!) but I've been trying to grow out my hair and I KNOW if I go in for more colour now, I'll end up chopping some off. So I'm going to HOLD OFF for just before the holidays and VA-VA-VOOM, I'll get some shiny new hair! So my go-to 'in-between' colour is L'Oreal's Colourista in Purple. 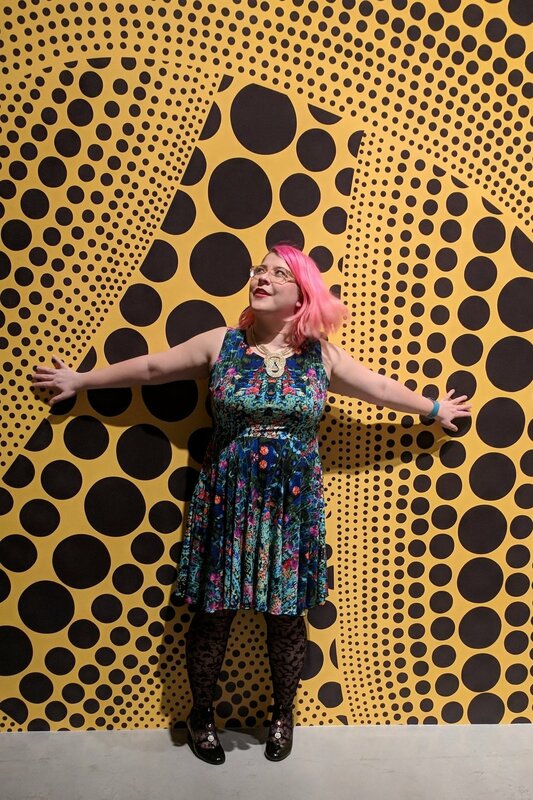 I know some people have had concerns with the Colorista line, but my hair was professionally bleached and I find it took very nicely to my hair and fades out appropriately. The intensity is up to you, I usually go for a wash of pastel purple and let it fade until my hair is an ashy-blonde again. I can get 3-4 treatments out of one bottle with my short ahir, so not bad for under $15! Let me know if you liked this look in the comments! Some of these products were provided for review, but all opinions are my own. Article contains affiliate links.